Row of cottages of the Packe (Prestwold Estate, 1853. Brick with Swithland slate roofs. Two storeys, single unit cottages. Gable to right of row. Three light casement windows with mullions and latticed panes. Dated 1853 with initials CWP. (built 1853. Middle C19. Grade II cottage). (built early 19C house. Listed 1984). Large house. C1800. Brickwork. Three storeys. Four bays. Pedimented doorcase. Sash windows. House. 1810. Brick with low pitch roof. Two storeys. Three bays. Inscribed stone in gable. W. Gill. 1810. Gill family listed in C19 directories as farmers and graziers. (built: 18C. Original type as farmhouse. Listed 1984). Farmhouse. Early C18. Brick with slate roof. L-plan. Two storeys. Four bays. 20 LOUGHBOROUGH ROAD. FIELD COTTAGE. (Early 19C. House. Listed 1984). Early 19C house. Brick with Swithland slate roof and gable stacks. Originally two single unit cottages, now a single house. Central door, sash windows. 22 LOUGHBOROUGH ROAD. ROSE FARMHOUSE. (Early 19C. Farmhouse. Listed 1984). Farmhouse. C1800. Brick with slate roof. Three storeys. Three bays. 38 LOUGHBOROUGH ROAD. FALCON HOUSE. (Early 19C. House. Listed 1984). House, early 19C. Brick with hipped slate roof. Central doorway. (18C. Listed 1966. Grade II) Small parish church of medieval origin. Largely rebuilt in 18/19C. 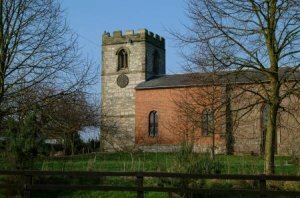 Built in 1834 by the Packe family of Prestwold. Wood panel on columns and bears the royal arms. HOTON HOUSE, WYMESWOLD ROAD, HOTON. (18C. Listed 1984. Grade II) House. Late 18C. Flemish bond brickwork.Three storeys. Three bays. 3 WYMESWOLD ROAD, HOTON. (C18. Cottage. Grade II. Listed 1984.) Cottage. Late 18C. Brick on rubble plinth. Two storeys. 5 COBBLERS COTTAGE, WYMESWOLD ROAD, HOTON. Three late 18C cottages. Brick two storeys Timber frame visible. 7 WYMESWOLD ROAD, HOTON. (18C. Cottage. Listed 1975). 9 WYMESWOLD ROAD, HOTON. (18C. Cottage. Listed 1975). 11 WYMESWOLD ROAD, HOTON. (18C. Cottage. Listed 1975). Cottage. Formerly two single unit dwellings, now one. Central plank doorway. HOLLY TREE FARMHOUSE, WYMESWOLD ROAD, HOTON. Farmhouse. 18C. refronting of an earlier building. Brick with Swithland slate roof. Gable end. Timber frame visible in left hand gable end. BARN TO HOLLY TREE FARM, WYMESWOLD ROAD, HOTON. Listed 1966). Barn, early 17C. Timber framed. Upper cruck visible in right hand gable. (17C. Grade II. Listed 1984). House. C17/18C. Four bays. Bickwork with timber framing. Swithland slate roof. HOLTS FARMHOUSE AND ATTACHED OUTBUILDINGS TO REAR. WYMESWOLD ROAD, HOTON. (18C. Farmhouse. Listed 1984. Farmhouse of early18C. Plain tiled roof on slight stone plinth. Two storeys. ATTACHED OUTBUILDING AT REAR OF HOLTS FARMHOUSE. WYMESWOLD ROAD, HOTON. (16C Cottage. Grade II. Listed 1966).Cottage. Late 16/17C. Gable to Street. Timber framed. Two-storeys. Small parish church of medieval origin. Largely rebuilt in 18/19C. Built in 1834 by the Packe family of Prestwold. Wood panel on columns and bears the royal arms. XHTML 1.0 validated. WCAG compliant. Page generated in 0.0826 seconds.